Brazilian artist Verita celebrates the elegance of a woman, painting this composition with a modern combination of styles. Against a striped, abstract background, the silhouette of an African woman is captured with poise. 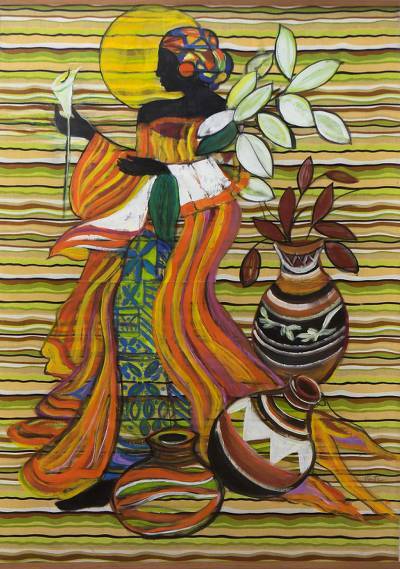 Surrounded by decorative vases and leaves, the woman holds a flower in her hand, appreciating its beauty. She wears traditional African clothing, a sunny halo around her head. Titled Simplesmente Mulher in Portuguese. You can find 'simply Woman' by Verita in paintings categories such as Cultural Paintings, People and Portraits Paintings, Modern and Freestyle Paintings and Acrylic Paint Paintings. Enjoy exploring these sections for other Novica treasures.